Chinese President Xi Jinping and his counterpart, Donald Trump, witnessed the signing of business cooperation documents worth more than $250 billion at the Great Hall of the People yesterday. Besides, Donald and Melania have seen or experienced some iconic Chinese culture. Let’s follow the footprints of the US President and have an overlook upon those classic Chinese features. In the history of Chinese art, it’s hard to tell which one is more important: calligraphy and painting have always been held as equal significance. These two art forms present not only visual feasts in aesthetics but also their creators’ inner voices and thoughts. There are various styles and schools of them. Traditional Chinese calligraphy could be generally divided into 5 categories over the seal character (Zhuan), the clerical character (Li), the regular script (Kai), the running-hand (Xing) as well as the cursive-hand (Cao). Chinese painting developed into two branches which are the freestyle way and the realistic way of painting. Madame Peng Liyuan and the US First Lady Melania Trump had a fun calligraphy class with pupils at Banchang Elementary School. 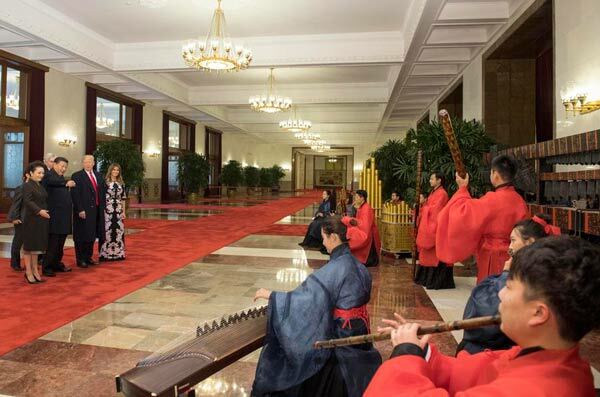 A chime bells (Bianzhong) performance is arranged for the Trumps at the Great Hall of the People. Chime bells, probably the oldest musical instrument in China, has been an exclusive art and entertainment only for the upper class from the very beginning of Western Zhou Dynasty. 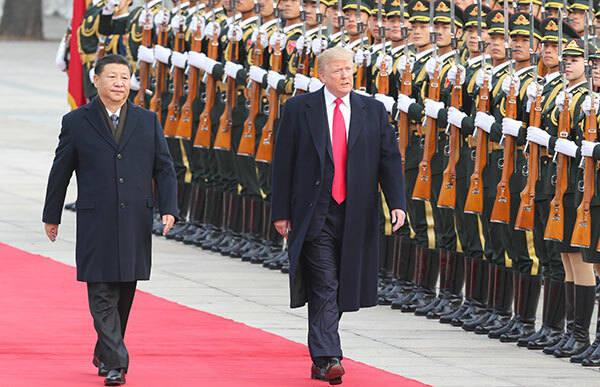 In front of the East Gate of the Great Hall of the People, President Xi hosted a grand welcoming ceremony for Donald Trump’s visiting China. Marking the victory of the Chinese People's War of Resistance against Japanese Aggression, Chinese Military Parade could be an attractive and amazing view for travelers and visitors, even the local citizens. It happens on Oct 1st every year which is Chinese National Day and is especially grand decennially. If you want to see what Trump sees, come to Beijing in beautiful late September and enjoy the splendid parade.